I loved Shiver. And after Linger, I was on edge, waiting for the third book to come out. I have it on my shelf now and will probably start reading it next week. I love this woman’s characters, and I think she’s an extremely talented writer. I ran out to see her like I would run out to see Holly Black, and that’s saying something. So please keep that in mind when I say that the whole thing left me feeling… uneasy. The stage was my first clue that something different was going on. 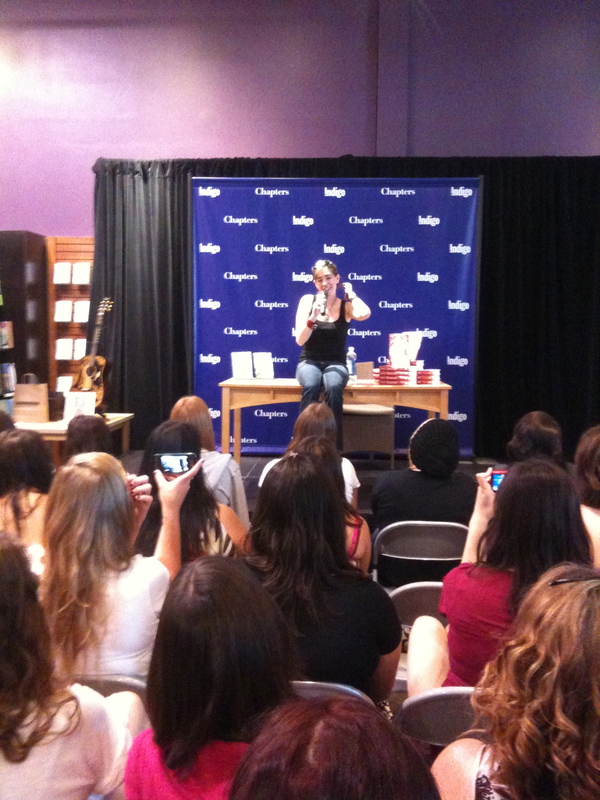 I’ve been to lots of signings and book launches before, even ones at Chapters. There’s never been a stage. And there was loud music. Rev-up-the-crowd type music. Maggie was wonderful. Entertaining and funny, friendly and seemingly perfectly comfortable in front of the crowd. She told funny stories about her book tours and got us all laughing. She talked a little about her book, but mostly about “life of an author” type stuff (you know — the phone calls on airplanes about hitting the NYT bestseller list; the visits to wolf sanctuaries in Hungary; everyday things). But that was when my stomach started dropping. Because she was up there and entertaining and wonderful for a solid twenty or thirty minutes; just like a stand-up comedian, only classier. And while in theory it was about the books, really it was about her. She was a Personality. A really wonderful, charming, interesting one. For me, that’s the scary part. I could never pull that off. Talk about the writing process? Sure! Just try and shut me up. I love that stuff. Talk about books? Absolutely, especially if they’re someone else’s books. I’ll happily do school visits; it’s not that far off from teaching, and besides, I can keep the focus on the writing process. But to get up there and just… be? It left me thinking about a few months ago, when I saw Sarah McLachlan in concert and was amazed by how warm and personal and just plain brilliant at the the whole thing she was. Not just the singing. The in-between parts, too. Pure, polished, professional showmanship. Now, let’s face it. I’m not exactly in danger of going on tour. The NYT Bestseller list is, thus far, not a going concern in my life. I’m still at that point in my career where I aspire to the midlist. I’m okay with that; I’m learning. Next spring I’ll have two books coming out; I’m thinking of getting in touch with independent booksellers within about a two-hour radius of my house and seeing if I can put together some kind of an event schedule. Maybe little free seminars, maybe signings. And at those events, there will probably be a small table and me, and maybe one or two friends if I happen to know people in town. I’ll bring candy to bribe people to come close. I’ll smile at them and hand out bookmarks. And for me, that’s good. That’s practice. That’s success. Don’t get me wrong, Maggie was amazing. Friendly and gracious and funny. I’m glad I went, and I look forward to reading the third book in her trilogy. Even more so, now that I’ve heard her talk about it a little bit. But this was my first glimpse of Writer as Rock Star, and I think it scared me a little. I went to see Maggie in Toronto! 🙂 I really like her personality, too; she’s interesting, and very talented! I was surprised to read that you’ve never seen a stage at a book signing before – I’ve only been to one where there wasn’t a stage! Most of the signings I go to are at large chain stores like Chapters, though, and they’re all pretty well promoted ahead of time. I don’t have an independent bookstore near my house, or even in my town. Just Chapters. Thanks, Ishta! And I’m really glad you enjoyed the Toronto show. Maybe I haven’t seen a stage before because I don’t usually go into Toronto–that would probably make a difference. I’ll have to watch to see what signings are coming up. I don’t think the bigger authors tend to come out this way as often. I was surprised (and very happy) to see that Maggie was going to be in Oshawa. And yeah, that’s okay…You’re learning and practicing – exactly what you should be doing right now. Stay motivated and keep learning, you will achieve your goals! [Also, I like your writing style]. Cookies are essential to the success of any public event. They may be essential for everything.